Amid a state of emergency for the New Jersey communities flooded in the latest round of storms, many residents are still scrambling to figure out what to do next. Although Gov. Phil Murphy signed an executive order Tuesday declaring states of emergency for Bergen, Essex, Monmouth, Ocean and Passaic counties, it's still too early to know if FEMA will come in. Some communities got enough rainfall for an entire month over the last few days. In the Jersey Shore community of Brick Township, 100 or so residents flooded out of their homes attended a community meeting Tuesday, trying to understand the process to recovery. But even as they work to empty their houses, most are being told by their insurance companies they're not covered. Homeowners Janet and Rob Burnside showed News 4 the destruction inside their home: three feet of water scattered memories everywhere, little of which can be salvaged. Their first order of business is taking photos of everything, but they're not even sure if they'll return. 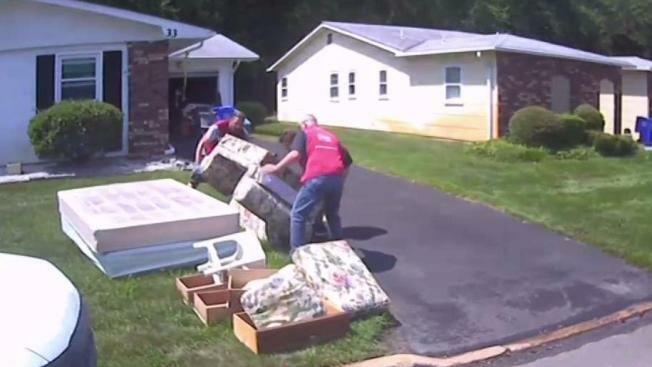 A huge mess has been left behind in Little Falls, New Jersey, after relentless summer storms. Jen Maxfield reports. "I don't know, where are we going to go?" The streets in the mostly senior community are littered with what used to be furnishings froms homes. The Red Cross is trying to help those who will stay, handing out cleanup kits of brooms, mops and bleach. On the Manasquan River, the backyard of a home on a small bluff has washed away: "My wife actually saw a huge part of the yard just break away," said homeowner Shawn Dunphy. 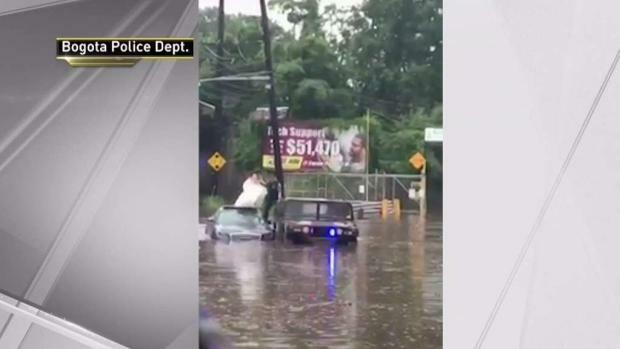 Cars floated away from a Nissan dealership in Totowa, New Jersey and dogs had to be rescued as thunderstorms and flash floods menaced the tri-state area on Saturday. Rana Novini reports. And in Monmouth County, four roads were closed Tuesday, including Allenwood Road in Howell, where bridges were severely compromised by rushing waters. Over in Passaic County, residents in Little Falls are still in shock from the sudden deluge over the weekend. John Reilly says floodwater from Saturday's torrential rain swept the foundation right out from underneath the Cedar Drive home he's lived in for 27 years. He's one of the lucky few with flood insurance, but it doesn't cover anything in his basement, which contained a bar, a pool table and a wine cellar. Reilly says the now-viral video showing vehicles from the Jeep/Chrysler dealership by the Route 46 bridge sweeping away and piling up is "what happens when you don't fix something." The makeshift dam stopped the Peckman River from flowing downstream and instead "found its way right into our neighborhood." 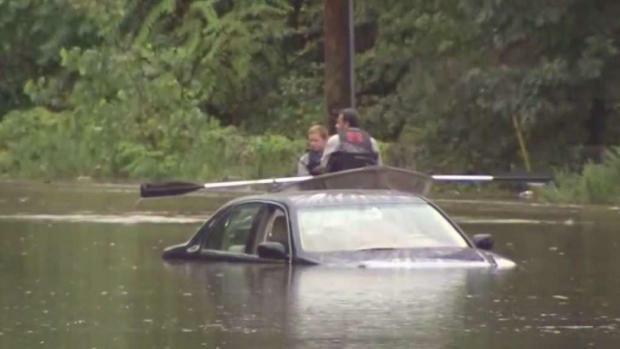 Little Falls and Woodland Park are investigating whether the Route 46 Jeep/Chrysler dealer had too many vehicles in general, and whether they were parking them too close to the river. Reilly says the towns have to make more room for the river at the overpass to prevent the next flood. "We did the Panama Canal, you're telling me we can't fix a creek? Give me a break," he said. 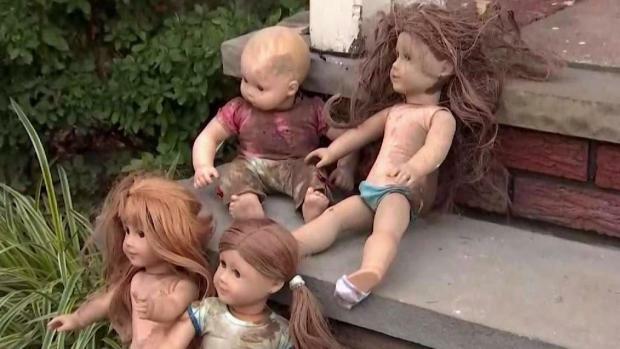 Other neighbors are devastated, having to leave so many of their waterlogged possessions out at the curb.